Just like diamonds, tattoos are forever. Or at least until the person with the ink decides he or she doesn’t want it anymore. Regardless of the size or location, removing it will require working with a professional who is trained in tattoo removal. Dr. Peter Vitulli in Jupiter, FL, is experienced and skilled at safely and effectively removing tattoos that his patients no longer want. Using PicoSure tattoo removal, Dr. Vitulli has had great success eliminating the tattoo and leaving healthy skin behind. PicoSure is an effective treatment because it uses advanced laser technology to penetrate through the top layer of the skin into the dermis, where the pigment is located. This allows the top layer of skin to remain healthy while the color is broken up by the laser. Using short wavelength pulses, the laser targets even the hardest to remove colors such as blue and green. 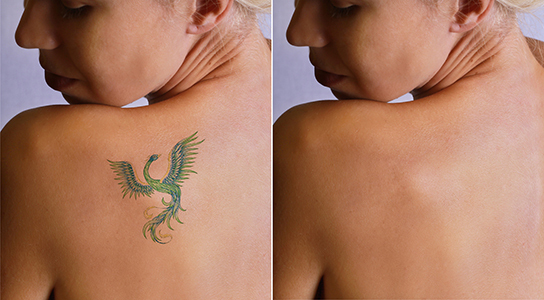 It is important to note that removing a tattoo is not a one-time appointment. It will take several appointments over a period of time to make the tattoo a distant memory. Various factors affect the number of appointments and length of time needed, including the size of the tattoo, the amount of ink that was used, the type of ink that was used, and how deep the ink is within the skin. Most patients report removal sessions aren’t painful but that the discomfort feels like being snapped with a rubber band. Following the appointment patients may notice that their skin is a little bit red or irritated. This typically goes away in a day or two. For more information about removing your tattoo, call the office of Dr. Peter Vitulli today to schedule a consultation. Dr. Vitulli will examine your tattoo and determine the number of sessions and costs necessary for removal.